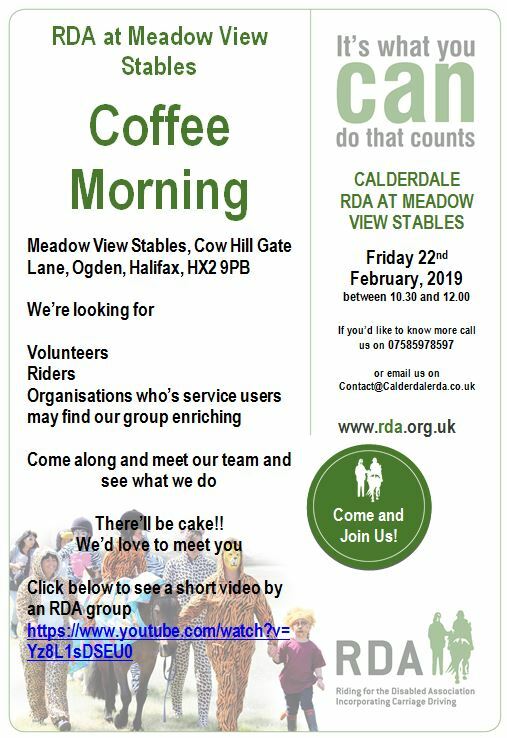 During half term, the Calderdale Riding for the Disabled Group will be holding a coffee morning on Friday 22 February, 10:30am-12:00pm at Meadow View Stables, Cow Hill Gate Lane, Ogden HX2 9PB. Calderdale RDA are looking for volunteers from spring in the role of sidewalkers and leaders so this would give you a chance to meet the team and look around. Purpose of Role: To support the session coach and encourage the participants to have a safe and enjoyable time. Main Activities/Tasks: Help preparing for sessions by gathering equipment, grooming kits and tack Be able to help and encourage the children whilst grooming, tacking up. Communicate the coaches’ instructions to the child in words and demonstration. Qualities and Skills: You will need to be caring, confident, capable and use common sense. Be reasonably fit and able to work as a team. Be able to take instructions and respond straight away. Any experience with horses or in a caring role with people will be useful but not essential. A kind, empathetic nature with a desire to be involved is great. This entry was posted in Events, Feb, Young People and tagged Riding for the Disabled.